GitHub.io killed the distro star: Why are people so bored with the top Linux makers? Raise your hand if you're interested – liar! LinuxCon 2014 Matthew Miller is a little concerned. As the new project leader for the Fedora Linux distribution, he thinks Fedora 20 is great and Fedora 21, when it ships, will be the best release ever. But he worries that to everyone else, Fedora – and Linux distros in general – are getting a little, well … boring. He doesn't just mean the general public, either. Miller believes much of the broader open source software community has turned its attention elsewhere, too – and at least part of the blame, he says, falls on GitHub. Speaking at the LinuxCon 2014 conference in Chicago last week, Miller said there are plenty of metrics that show how overall interest in Linux distros has waned since their popularity was at its peak, around 2005–2006. One example he gave was the conference itself. At one time, Miller said, shows like LinuxCon would have been lined with booths showcasing free Linux distros like Fedora, Gentoo, OpenSuse, and others. This year there were none, and Miller observed that their absence wasn't entirely due to lack of funds. "Over the last couple of years, those have really been less interesting for the people at the booths," he said. "Our interactions are not that great. It really doesn't seem to build up the community at all." But Miller's favorite ad hoc metric is Google Trends. 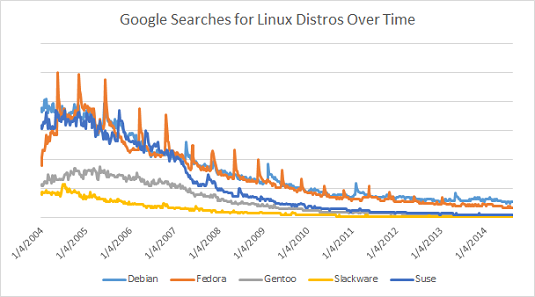 Plot the frequencies of Google searches for the names of once-popular Linux distributions over the last decade and you can see the steady decline, to where interest in some distros has practically flatlined. Not even Ubuntu, which exploded in popularity a few years ago, seems immune to the trend. So what does GitHub have to do with all this? There's no direct correlation, to be sure. But Miller pointed out that while one core audience for Linux has always been open source software developers, open source projects no longer have the symbiotic relationship with Linux distros they once did. Before the advent of comprehensive Linux distributions, you typically had to download your favorite free software from the creator's own website, or from a file hosting site like SourceForge. Open source software came in many forms and formats, and making it work with your particular OS installation was often a headache. One huge selling point of Linux distros was that they eliminated this problem. A good Linux distro scoured the world of open source software and assembled the best of it into a cohesive, easy-to-install bundle. Users no longer needed to compile their own packages. After a while, they began to resent it when they had to. As a result, developers very much wanted their software to be included in the more popular distros. The rise of GitHub has changed this dynamic. Rather than just offering links to tarballs for download, GitHub allows developers to publish their source code in a standard format, accessible by a common set of tools. As a result, Miller observed, GitHub has rapidly become a preferred way for open source developers to offer their software to the public.